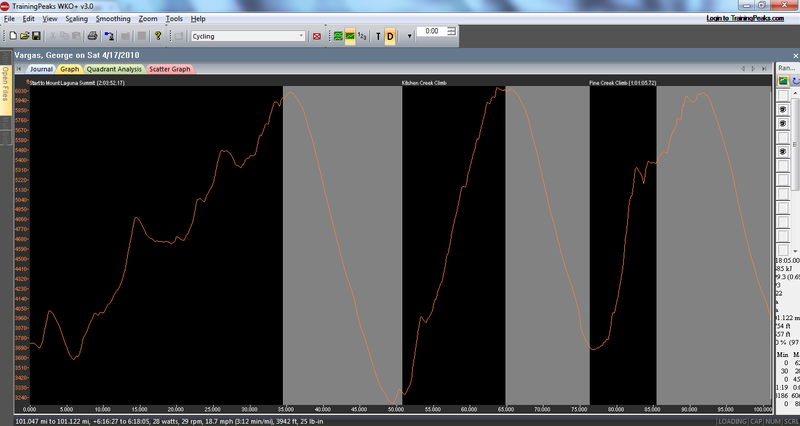 The course is really simple three major climbs with three long descents on Sunrise Hwy for recovery. AdventureCorps for putting on a fantastic event- well organized, well supported, challenging, rewarding and a great vibe and atmosphere. Adobo Velo for your support on the course and the post-ride food that was cooked seemingly to order and so it was fresh and tasty. And lastly, the AdventureCorps family of volunteers you are what make the event special. Thank you!! I am happy with my result. There were faster riders present that just plain rode away from me. I am a little concerned with the the amount of cramping I was experiencing. I can’t remember when I have ever cramped as much as I did on Saturday. I couldn’t get it resolved throughout the day. The first time I summited I took four Endurolytes. I then took four more at the gate for Kitchen Creek (about a 1/3 of the way up the second climb). 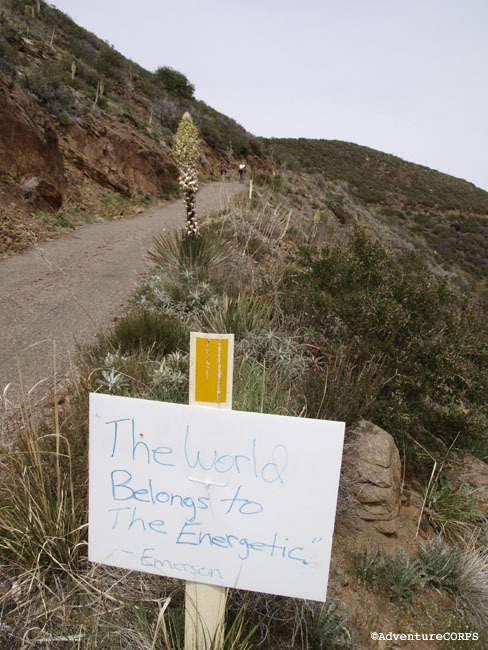 On my second summit of Mount Laguna I took eight Endurolytes from the volunteers- four at the rest stop and four more to take on the descent. 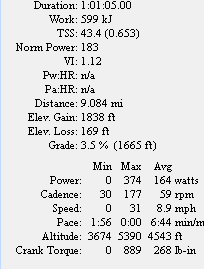 I took that many Endurolytes because I was concerned about cramping on Pine Creek. A 20% grade is the last place you want to cramp when going 4mph. Of course it would look really funny just toppling over. I left with the first wave at 6am. I heard people saying it was in the high 30’s and some saying low 40’s F. Regardless of the exact temperature it was cold not chilly. It was cold but I knew once we started the climb to Guatay I would warm up quickly. I went with my 2009 Furnace Creek 508 vest and dispensed with it after the first climb. The pace was good, not too hard, but we split the group fairly quickly. I looked around and recognized a few people like Ton “Desert Fox”, Jack B “Blackbird” Adam “Rock Rabbit” Bickett, and Jim Knight,. The group got really small as we turned onto Sunrise Hwy (from the Julian side) for our first ascent of Mount Laguna. Now we were only six. When you look at the elevation profile you will notice it isn’t one continuous climb-rather it is a rolling stairstep climb. Adam “Rock Rabbit” Bickett was setting tempo and soon it was just he and I leading the rest. I looked back and there was a noticeable time gap. Adam was riding his fixed gear again and I believe he was riding a 46 x 16. His gearing is really close to the gearing I used on my fixed gear year at Furnace Creek 508 49 x 17. It’s a tall gear but this event has a lot of descending and you need to gear for the downs as well as the ups. Adam’s pace was a little tough for me and I was dropped by him. As I backed off Rock Rabbit’s pace the other riders in our six man “break” slowly crept up to me and passed me. On one of the rollers I didn’t have it in me to push hard enough, close the gap, catch a wheel and a draft and was gapped significantly. I couldn’t keep up so I went alone for a little while. I eventually caught the Desert Fox and a triathlete (camo painted bike) and we summited and descended together towards Kitchen Creek. We began the climb together but I just couldn’t keep up. I guess the lack of training since Hell’s Gate Hundred was really coming into play. I had only ridden four times since the HGH and it was very apparent I am loosing fitness. I let them go and then climbed at my pace. At the gate for Kitchen Creek I was passed by Cliff Clermont, with another rider and Sean “Crow” Cuddihy, a 508 veteran. These three riders were on fire and had left on the 6:10am wave. They had caught me in just 55 miles. While on the climb I was passed by the eventual winner Drew Peterson. He was part of the 6:20am wave. Drew’s time was simply amazing at 5:22. Great job dude! I climbed at my own pace and felt defeated that I was passed by so many riders in the first 55 miles. I was battling cramps all the way up this climb. Cramping is something I am not accustomed to dealing with during an event or training for that matter. Even when I do cramp it subsides quickly and it doesn’t impede my performance for very long. A couple of times I grunted aloud with the pain of the cramps. I made my way to the summit a second time and took eight Endurolytes – 4 then and 4 for the descent. I was alone now with no other riders around. The hard thing about riding long distances is how to pace and motivate yourself when you end up alone. You loose valuable time because there is no one to push you and you get complacent with your pace. Being in “no man’s land” between the lead riders and the slower riders is tough on your psyche. The power meter helps with pacing but having another wheel in front of you pushing you out of your comfort zone. 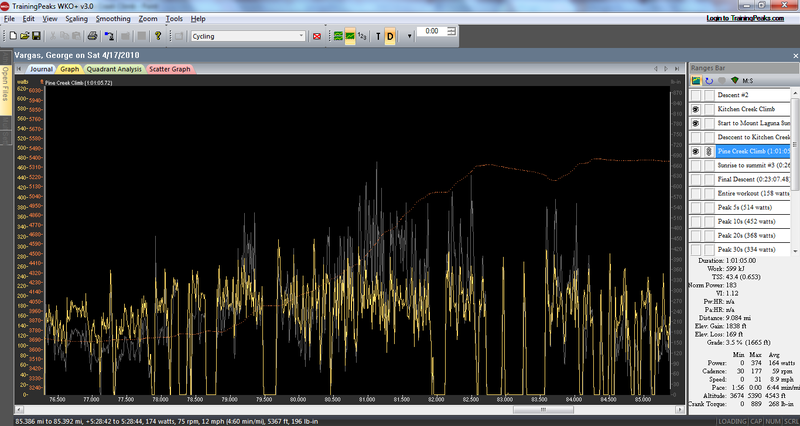 Needless to say, I got comfortable with a slower pace and lost valuable time to the lead riders. 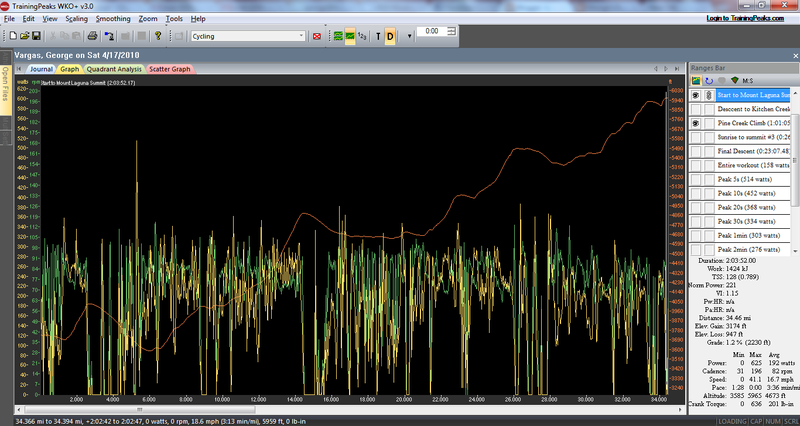 Pine Creek Climb notice Grey line is torque. I rode the third loop alone. 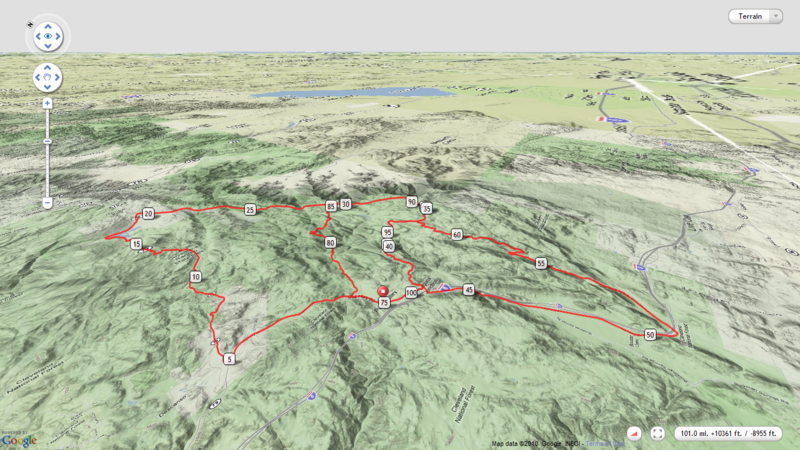 I climbed Pine Creek alone and passed only two riders– Jim Knight and Adam Bickett. 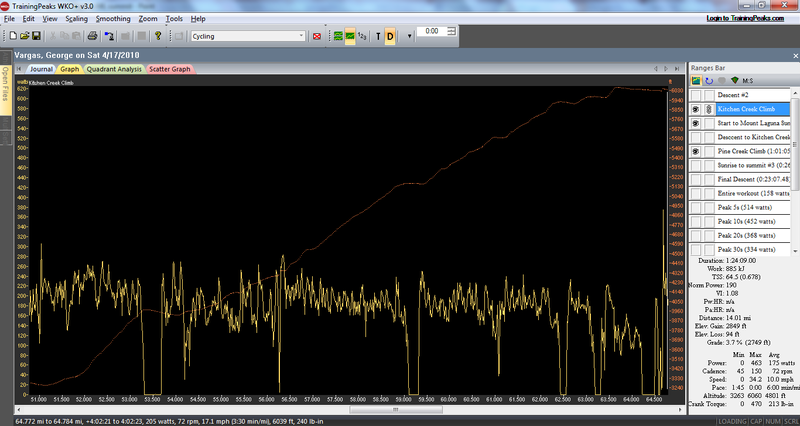 Is it fair to claim that I passed Adam since he was on his fixie and the climb had significant number of ramps of 20%? I never dismounted. Although I had to keep the intensity down because I could feel my heart rate soar every time I tackled one of the 20% grades. 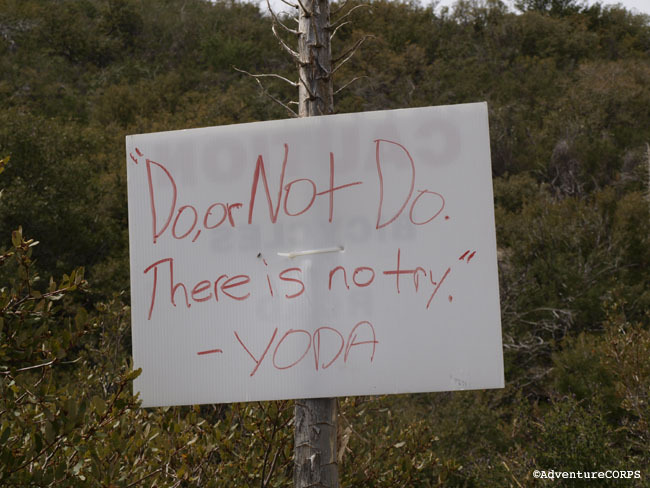 It was awesome to see handwritten signs on the side of the road on Pine Creek Road. It motivated me to speed up and read the next one. The quotes themselves were inspirational. But even more than the quotes was seeing the author’s name of the quote. It made me think of the people and the time frame in which they were alive. People like Churchill and Emerson and Buddha brought even deeper thoughts than the quotes themselves. A big thank you to the responsible party for making those signs– very thoughtful. The signs were strategically placed and we were going slow enough to ponder them. 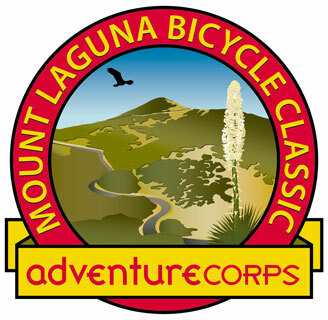 The Mount Laguna Bicycle Classic is soon to become a classic in the true sense. 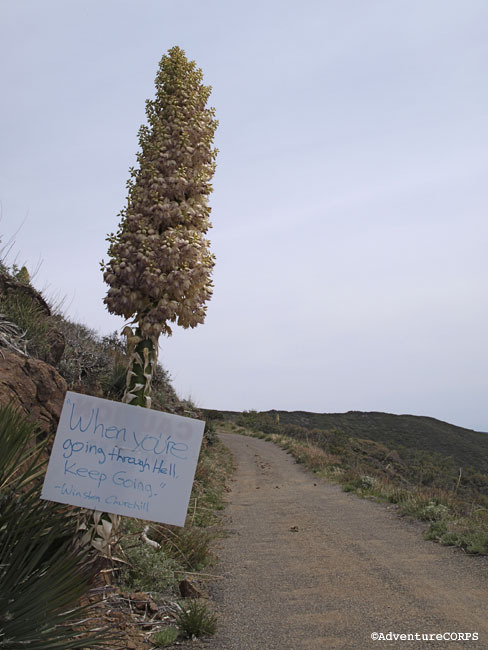 The event is in the East San Diego County mountains where vehicular traffic is significantly lower than that of urban centuries put on by other event organizers. The climbs are epic the downhills are fast but safe. The views are spectacular. It is accessible from downtown San Diego within only an hour but yet you feel completely removed from anything urban especially when climbing my favorite climb — Kitchen Creek. Put it on your calendar for next year APRIL 16, 2011! I’ll see you there. 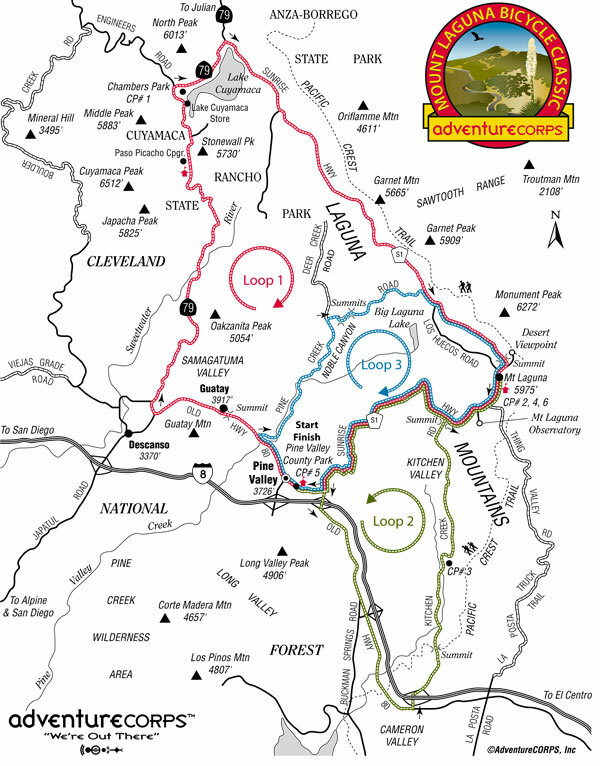 This entry was posted in AdventureCorps, Mount Laguna Bicycle Classic by REV Cycling Directeur Sportif. Bookmark the permalink. 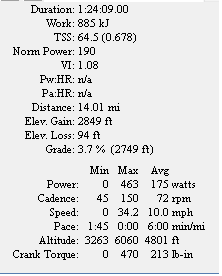 George, what is up with the flat spots that sink to 0 in your power output on Pine Creek Climb? 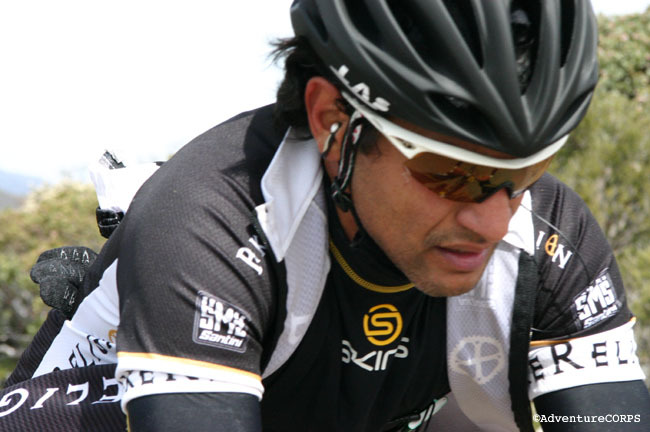 Hey Steve thank you for visiting my blog.I am using a Ant + Power Tap that is sending the data to my Garmin. 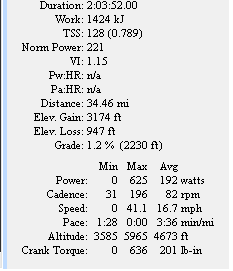 Some of the flat spots are associated with no actual power output but I have noticed that the Garmin doesn't pick up everything. It pisses me off actually. George-did you switch from "smart recording" to every second? Anonymous thank you for you comment. Please explain. Is there a setting on the Garmin (310XT) that I can change for it to be more accurate? I welcome your input I have been frustrated with this shortcoming from my Ant + set-up.